Can you imagine what this could have done to your roof!?! 1/2 FEW, IF ANY, ROOFS DAMAGED. Bushes and trees- leaves stripped; crops- damaged. Oxidation coatings on paint, wood, metal- spattered. 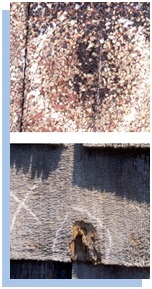 Thin elastomeric coatings on polyurethane foam roofs- cracked or broken. 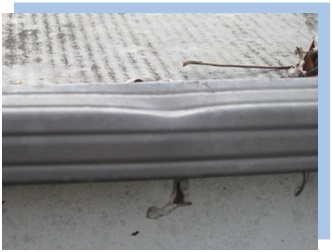 Thin aluminum vents, fins on air conditioning units, lead sleeves on soil stacks, window screens, aluminum awnings- dented. 3/4 THRESHOLD SIZE FOR DAMAGE TO ROLL ROOFING AND DETERIORATED ASPHALT COMPOSITION SHINGLES, ESPECIALLY WHERE UNSUPPORTED. Painted wood surfaces, deteriorated gray-black slates (especially at corners)- chipped. Most aluminum vents, flashings, valleys, siding- dented. 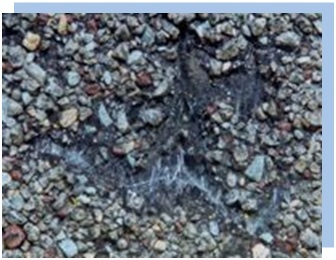 1 THRESHOLD SIZE FOR DAMAGE TO MOST LIGHTWEIGHT ASPHALT COMPOSITIONSHINGLES. Thin and/or deteriorated wood shingles, shakes- occasionally punctured or cracked. Single-pane windows, thin skylight shells- cracked or broken. 1-1/4 THRESHOLD SIZE FOR DAMAGE TO MOST HEAVY WEIGHT ASPHALT COMPOSITION SHINGLES, WOOD SHINGLES, AND OLDER MEDIUM SHAKES. Automobile body metal- dented; galvanized metal vents- dented. 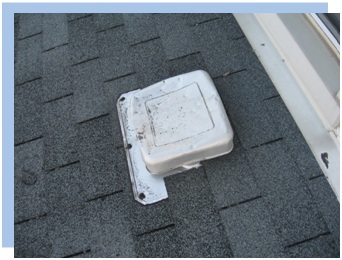 Older plastic skylights- cracked or broken. 1-1/2 THRESHOLD SIZE FOR DAMAGE TO CLAY TILE, SLATE, MEDIUM SHAKES, AND MODIFIED BITUMEN SINGLE-PLY MEMBRANES. Automobile body metal- extensive denting. 1-3/4 THRESHOLD SIZE FOR DAMAGE TO HEAVY SHAKES AND CONCRETE TILES . Metal vents- caved in. Bare spots and blisters on deteriorated built-up roofs- bruised or punctured. 2 THRESHOLD SIZE FOR DAMAGE TO JUMBO SHAKES, WELL-SUPPORTED UNBALLASTED BUILT-UP ROOFING, AND UNBALLASTED EPDM. 2-1/2 THRESHOLD SIZE FOR DAMAGE TO WELL-SUPPORTED BALLASTED BUILT-UP. Asphalt exposed will be dark black in color. Coincident soft spot (“bruise”) with freshly exposed asphalt. There may be some loose granules remaining within the impact area. No shrinkage of reinforcement at impact-caused fractures. Bright hail impact mark/indentation on the wood. Coincident fracture with bright-colored wood in the fracture. Punctured area in wood that exposes brightly-colored underlying wood. Broken pieces of wood still present. Bright marks or indentations in the cedar from hail impact are readily visible. The marks and indentations do not represent functional damage, but the presence of hail and relative size(s) normally can be confirmed. 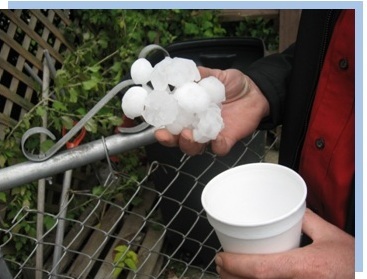 Splits from hailstones occur at the moment of impact. Marks or indentations in the wood without splits are not damaging to the wood. Asphalt exposed will be weathered gray in color. “bruised” area is now bare, or remaining granules are not particularly loose. 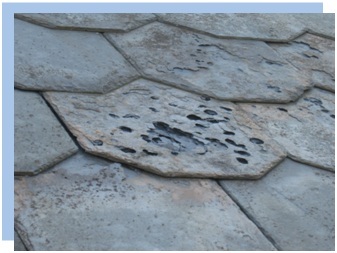 There is shrinkage or curling of the shingle reinforcement from the center of the impact area. No collateral indications of recent large hail. Possibly collateral indications of large hail such as dented metal, but without fresh spatter marks. No fresh marks on the wood surface, but some weathered indentations visible in the wood. Splits with large indentations have at least some weathering along the top of the split. The lack of fresh markings on the cedar surface would indicate that significant hail had not fallen recently. 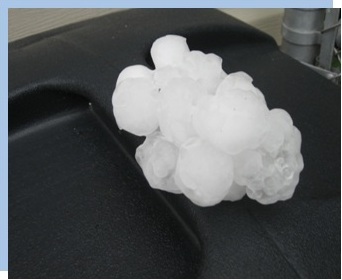 “Dents in your vents” are a good indication your shingles have been damaged by hail. A close up of a hail bruised shingle. Hail damage to slate roofing illustrates the intensity of the May 24th hail storm! Hail dents to your gutters are no different from having hail damage to your vehicle, it depreciates the value of your home.